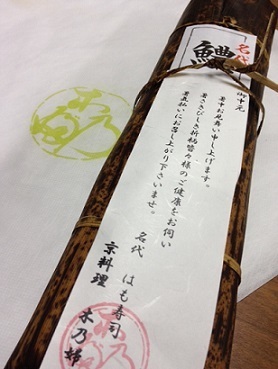 We received a summer gift from “Kinobu”, a restaurant which serves traditional Kyoto cuisine. They brought us famous “Hamo-zushi (conger pike sushi)” this year again which we enjoyed with all the staff in LST Kyoto. It is said that famous “Gion matsuri (festival)” was used to be called “Hamo matsuri”, as people often sent “hamo” each other in this season. Kinobu has been serving traditional Kyoto cuisine for about 70 years over three generations, and their “Hamo-zushi” cannot be found any other places. Thanks for the delicious summer gift, Kinobu.